Open to all skill levels and individual players who are looking to practice and to optionally be placed on a team during the Winter months. Cinics are recomended for soccer and futsal players who want to improve their footskills, quick thinking and tecchnique within a small team environment. Samba Futsal Local Teams are individual and team players registered on our Woodbridge clinics who are interested in competing in local tournaments. Teams will be formed during clinics training sessions with players of the same ability. 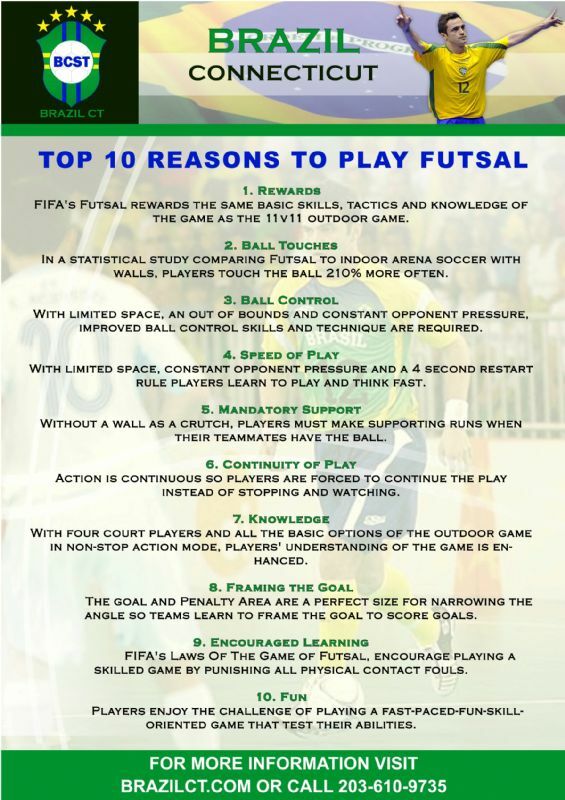 This is the first developmental step for players to enjoy, learn, and compete playing Futsal. Practices are 90 minutes long on Friday Nights and held at Everson Soccer Complex in Woodbridge CT. Practices will be divided into Futsal, Turf, SAQ and Striking clinic. The goal of this program is to develop individual skills using small side games (futsal) and translate this to the outdoor game. Practice Dates: Nov. 30th, Dec. 7th, 14th, 21st, Jan. 11th, 18th, 25th, Feb. 1st, 8th, 22nd, Mar. 1st, 8th, 15th, and 22nd.